We walk on the narrow dirt paths and I cling to the rocks for fear I will slip and fall down the mountainside. We turn right and squeeze down a narrow ally and reach her door on the left. We knock on the dilapidated sheet metal and step into the tiny 10×10 dirt floor room. The walls are made of corrugated tin, there are no windows and it is dark. I make out a bed in the corner where a mother lays nursing her baby, her two year old sprawled on the bed by her feet. Her face looks downcast and the depression hangs heavy in the room. We check on baby as Carmelle speaks to her and asks questions. I ask permission to take a picture and the mother nods, but is not enthusiastic. I show her the picture and get the smallest glimmer of a smile. I am the last to leave the room and I feel a sadness come over me. 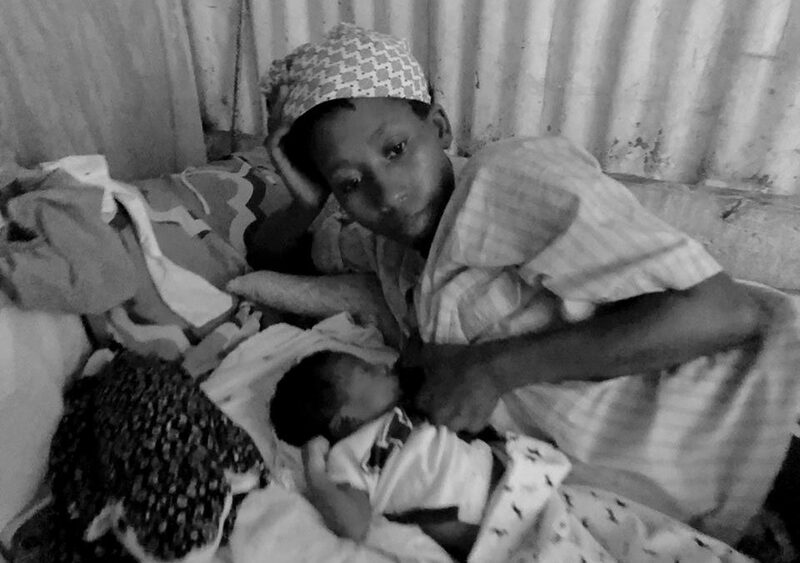 How can I leave this mother here, with babies to care for in this dirty room on the hill with no water, no toilet, no kitchen, and so little means? My mind searches for how I can help, and the only thing I can think to do is turn around and press a 20 dollar bill into her hand and kiss her on the cheek. I feel somber on my walk down the mountain. We get to the 400 steps and as we walk down them women come out of their doorways to greet us. These are women who gave birth at MamaBaby. They recognize their midwives. My heart is lifted by the lovely Bonswa’s and beautiful smiles. When we reach the bottom someone is blasting Carribean music into the air and again my spirit is lifted and Carmelle and I dance the merengue together down the street to the awaiting car.